Elena began working with Praxis in March of 2018 and has been involved in the movement to end power-based violence for eight years in roles as advocate, activist, organizer, and researcher. She is a graduate of Hamline University with degrees in Social Justice, Women’s Studies, and Creative Writing, and has also been part of the movement for prison reform and efforts to diversify literary voices. Throughout her social justice work, she has kept a focus on the healing and empowering capacity of creative expression. Elena is an emerging author of contemporary fiction novels. She likes to travel the world, lift weights, and spend time with her family, friends, and partner. 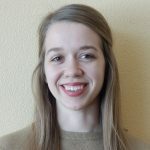 Elena was a co-creator and lead researcher of a three-year collaborative study entitled Knowledge of Sexual Violence Policies and Incidents in the Hamline Community. Anonymous survey data was collected annually from at least 25% of the undergraduate population, with statistics such as student experiences of sexual violence, and comprehension of Title IX and reporting policies. Results were shared directly with upper administration. Data informed decisions of offices like Athletics, New Student Orientation, and Residential Life. Survey methodology and data were presented at the 2015 National Women’s Studies Conference.